One of our most popular new models, the Burke C is custom-designed with standard lifestyle features including solar panel, washing machine and enclosed shower to make travel a breeze, and a wide variety of options you can add to complete your dream caravan. 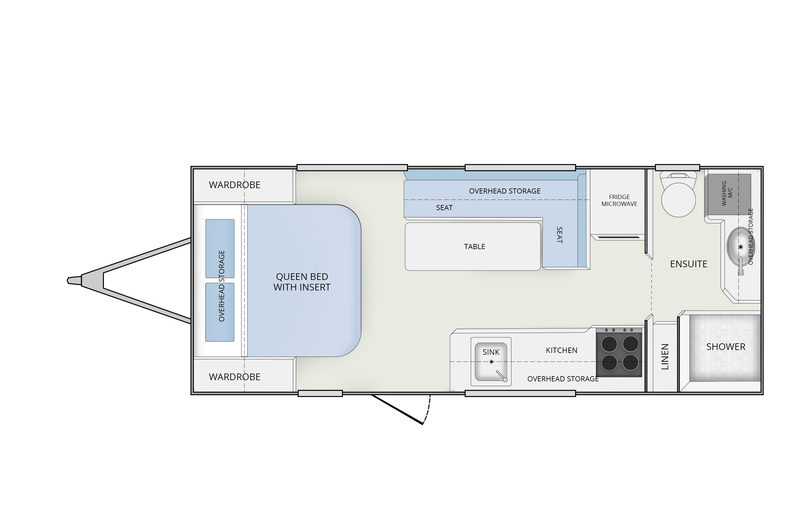 Australian-designed and constructed to the highest standards, the Burke C offers spacious living complemented by a smart kitchen layout and plenty of storage. Make this modern classic your home away from home. 150W solar panels, giving you comfort and allowing you get off the grid for longer. Using durable yet light composite panels, as well as a one-piece roof and floor. Stronger, lighter, longer-lasting. Experience the luxuries of home whilst on the road with a washing machine as standard. Optional Extras ‘Platinum Edition’ Includes: Wall and roof panels 'silver' exterior gelcoat finish, 'Titanium' colour stone guard paint on front wall, White rear bumper.